Remember those 5x7 digital pages I created in December? I had the pages printed and finally took time this past weekend to create chipboard covers and put it all together with my Bind-It-All. It's always so exciting to complete a project. Here's a look at the finished album. Have you completed any pending projects lately? Melissa, that is just adorable. 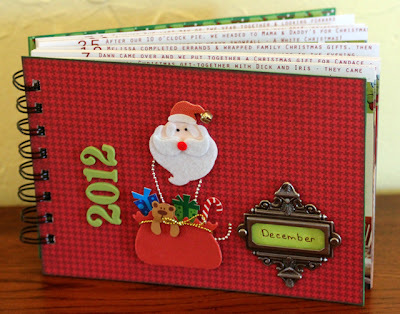 You did good in finishing it and even binding it before the next December journal! Thanks for the link. VERY nice Melissa! I've just GOT to have one of those bind-it-alls. I believe I'll do the same 7x5 pages again next year for December Daily. Love the cover...so cute! Great job getting this project finished. what a lovely album, soon be time for the next one!! Bravo to you! I didn't do a monthly make for February, but hope to do one for March.